My alma mater, California State University at Dominguez Hills, this past year celebrated its 50th anniversary, 1960-2010; they celebrated through commencement 2011, and had invited on their website alumni to share memories. The invitation limited submissions to 200 words, a detail I initially missed (ever the perspicacious student). 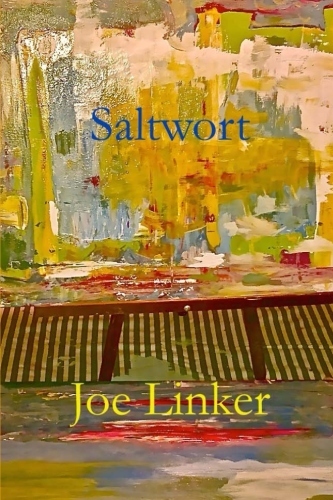 But while I did eventually whittle my college memoir to the requisite 200 words, I was a little late with it, so I thought I might as well post the whole hog here. What do I remember about Cal State Dominguez Hills? I was a student there in the 1970’s, first for a Bachelor’s in English, having transferred from El Camino, then, after teaching for a couple of years, for a Master’s in English. It’s been a wonderful world, as Satchmo sang, but those years as a student were the best. Many days I rode my bicycle to school from my folks’ place in El Segundo, winding my way through the small towns, finding new routes to avoid traffic, no helmet, no bike lanes – I know, sounds like the clichéd story of how Grandma walked five miles through five feet of snow to get to the school bus stop, then rode the rickety old school bus another seven miles to the one room schoolhouse. Actually, CSUDH in the 1970’s had a program something like a one room schoolhouse, called “The Small College.” Students in the Small College created their own, interdisciplinary curriculum. The program was experimental and well suited to the student population at the time. We were a small school yet, no football team; we won the national badminton championship one year when I was there. The campus in those days, the rise from the west particularly noticeable if you happened to be approaching the school on a bicycle, was a peaceful, quiet, lovely place, full of open spaces and views of the surrounding South Bay areas. The campus never felt crowded. In the courtyards below the library, one could sit under trees and listen to the music students practice their instruments, the silences filling with breeze. Many of the books in the library were still marked “Cal State Palos Verdes,” the first planned site, before reconsideration following the Watts riots called for a campus nearer the south central inner cities. 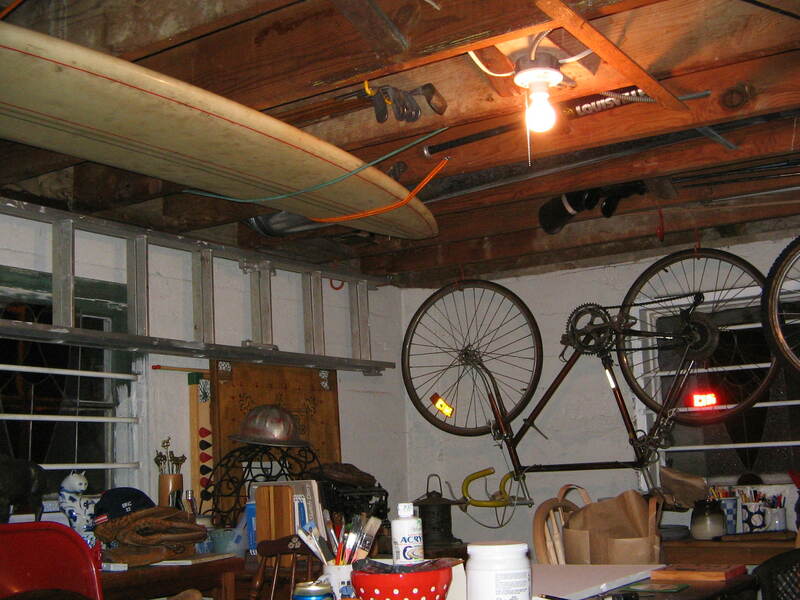 Raleigh Super Course I rode to campus and 9' 2" Hobie - hanging from joists in basement. I still have that bike; it’s hanging in my basement, an old Raleigh Super Course, with decals from Redondo, Hermosa, and El Segundo. Between the Bachelor’s and the Master’s, I rode it occasionally (when my VW was down) from El Segundo to Venice, where I taught junior high grades. It’s not been on the road in awhile (the 9’ 2” Hobie surfboard also hanging from the joists hasn’t been in the water in awhile, either). 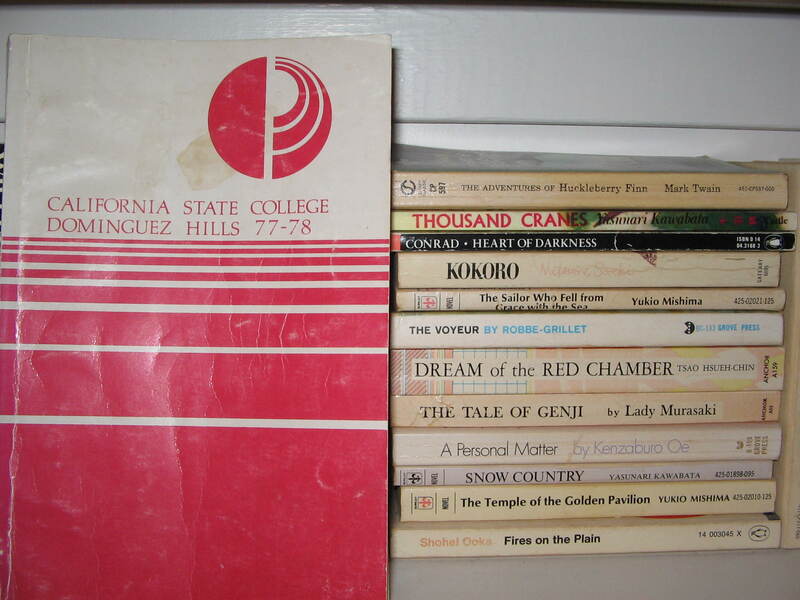 CSCDH Catalog, 1977-78, next to stack of books I read for classes. 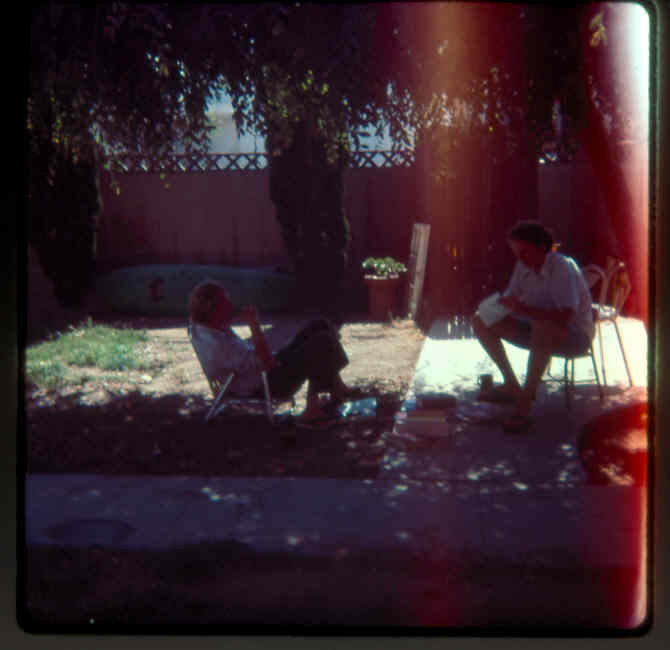 With Dr. Mahon in backyard on Mariposa, circa 1978. We understood that we were in on the beginning of something, that someday there would be more buildings, more students, that the campus would grow into a cultural center, and there would be different teachers, and new students. What a remarkable time and opportunity, to be among those who helped start and build a college. It was a beautiful place and time, not without conflicts, external and internal, but no regrets; we had a good time, and learned to stay true to literature: Happy 50th, Dominguez Hills! What wonderful memories you have shared. Never doubt that the day will come when student will fondly remember Joe Linker. Hey, Barb! Thanks! Talked to John a few days ago, too. And speaking of teaching music, ZZ got a little guitar, blue guitar with button-60’s flowers, used. I cleaned it up a bit and put new strings on it. Got things going with a few Raffi songs. That is too cool! Start them young! Hannah is really enjoying the marching band. Great clarinet player. Thanks, Lisa. Trust all’s well. Hey, Dan: Thanks for reading and commenting! I just read this again, and again I was moved. You are such a great writer and an inspiration even though I have not written anything on my blog, I am hoping one day all the words will come together and I will be able to write! Where is Agnes Yamada now? I believe you’re referring to my English teacher at South Eugene High School in the 1960’s. I’d love to find her and thank her for being such a terrific teacher.